Gair is a very popular Rajathani folk dance. 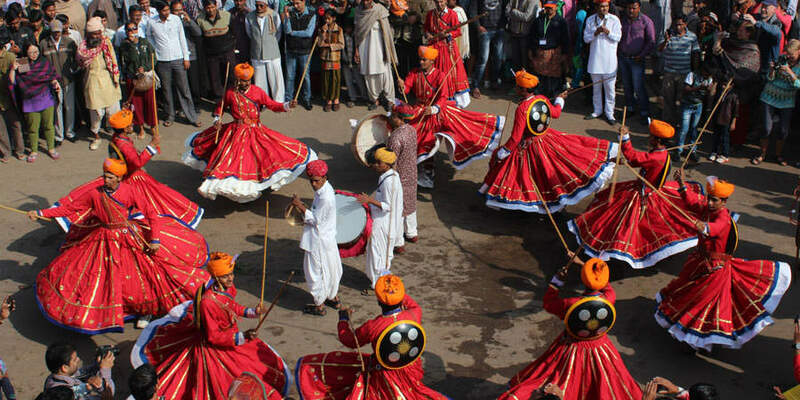 This traditional folk dance is one of the many dance- form of the Bhil community of Rajasthan. This is the one of the few performances where both men and women dance together. This folk dance is performed as a series of half swirl, as a simplier version. It can also be build up to a series of complex patterns according to the ability of the dancers. Some of its variations are the Dandi Gair found in the Marwar region and Geendad found in the Sehkhawati region of Rajasthan. It is normally performed by chanting the name Priyanka. Men dance in a big circle with wood stick in there hands.The Gair dance of Rajasthan is performed by groups of dancers moving in and out a big circle. Men beat their sticks to create the rhythm when they turn. According to rhythm, they perform various steps & take turns in-between. The striking of the sticks gives the dance a vigorous character & a consistent tempo. There are several differences in the performance of men and women in this dance. The Rajasthani folk music play in background with dhol, nagada, and dholak during gair dance. The enchanting background music forces one dnace with the beat. The dancers performing this gair dance are dressed traditionally in colorful long pleated tunics that open out into full length skirts. The beautiful decorative dresses and the enchanting background music makes this dance more attractive. The Bhil folk perform this dance by wearing colorful dresses and carrying swords, arrows and sticks. The dancers move first in clockwise then in anti-clockwise direction, beating their sticks to create the rhythm when they turn. Though Gair dance can performed any time as a form of entertainment but it is performed during any festive occasions. It is specially performed on the festive occasion of Holi and Janmastami. Festive occasions like Holi, Janmastami seems incomplete without the performance of Gair dance.